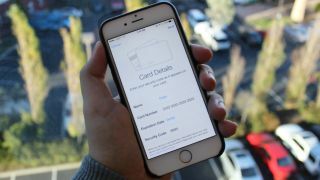 Apple Pay seems like a promising mobile payments method for iPhone 6 and iPhone 6 Plus users, but it's nothing if it lacks support from retailers. Some, including Rite Aid, CVS and Walmart, have begun shunning Apple Pay, but only Walmart has provided an explanation - and it's exactly what we suspected. The massive retailer told Business Insider that it's holding out for the solution in works at the Merchant Customer Exchange (MCX), an alliance of retailers making its own payment service called CurrentC. "MCX member merchants already collectively serve a majority of Americans every day," the retailer's statement reads. "MCX's members believe merchants are in the best position to provide a mobile solution because of their deep insights into their customers' shopping and buying experiences." This quote is the real kicker, though: "Ultimately, what matters is that consumers have a payment option that is widely accepted, secure and developed with their best interests in mind," reads the retailer's stance. Because that definitely doesn't describe Apple Pay? Apple, meanwhile, remains obstinately positive in the way only a company with Apple's overwhelming ubiquity can. "The feedback we are getting from customers and retailers about Apple Pay is overwhelmingly positive and enthusiastic," the company told Business Insider. "We are working to get as many merchants as possible to support this convenient, secure and private payment option for consumers. Many retailers have already seen the benefits and are delighting their customers at over 220,000 locations." Hopefully that number doesn't dwindle any more than it already has.